Last year, my assistant, Aspen Walker, asked me what I thought would be useful for her as she explored the library environment, and investigated paths to administrative positions. (Her background includes a recent MLIS, and years before that working in public relations.) I suggested that she interview a variety of library leaders, mostly around the metro area. She did so, and wrote up this report, which I suggested she share with anyone who might be interested. It's a good snapshot of several big trends in Colorado today, and is thus a good discussion piece. It's called "Trends, Tips & Techniques." This new blog, "Bottles 2 Backpacks," is a monthly blog hosted by Youth Librarians at Douglas County Libraries. As my wonderful staff say, "Our focus will be on children from birth to age 12. We look forward to sharing tips and ideas about parenting from parents and librarians each month. Feel free to comment on our topics and please let us know what parenting questions and concerns you have so that we can discover the best resources and answers for you." A man with my name, only a little older (61) died in Grass Valley, California on January 12. It happens that my family and I were out there in 2008 to a wedding. It also happens that this other James H. LaRue was born in Harvey, IL, not that far from where I was born. I'm not aware of this branch of the family. But it's clear from his picture in the obituary notice (click on this entry's title to see it) that he's definitely kin. He sounds like an interesting guy. I'm sorry I didn't know him. 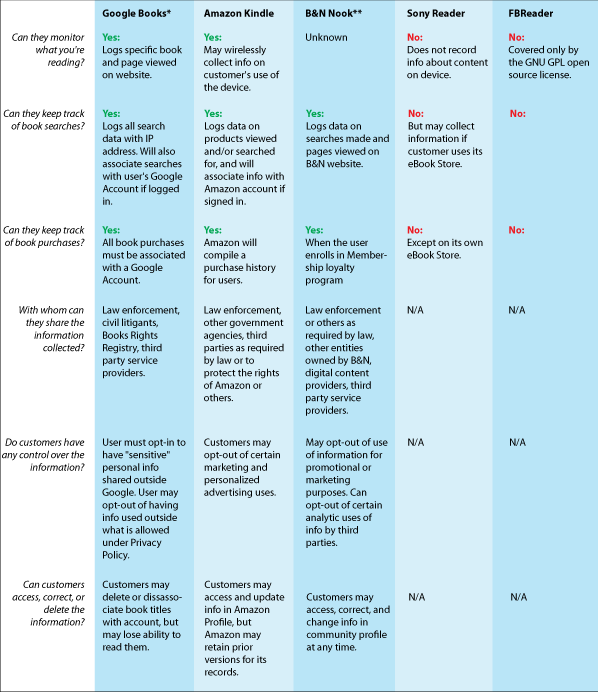 The Electronic Frontier Foundation put together this handy chart that begins to compare some of the ways your privacy might be compromised through the use of ebooks. Of course, the same sort of thing applies to public libraries: we create records of what you borrow. On the other hand, our systems are designed (the better to protect your privacy) to forget what you borrowed, providing only that you bring it back on time. Thanks to Suzanne for sending me this. We're still comparing our various readers. (She has a Kindle, I have the Sony Reader, and our son Max has an iPod Touch.) Privacy isn't usually on the feature list -- should it be? My son, Max, "Just made up a new word: Blunderstruck. Like, bewildered? Except it sounds awesomer." It sure does. I'm blunderstruck. What do you give the man who has everything? Somewhere to put it! Once you have succumbed to the need for maximum gadgetude, you need some slimming way to carry your kit. Enter the SCOTTEVEST. Seriously, this is the ideal travel vest. It is, in essence, another piece of carry-on luggage, but wearable. It also looks sharp. I mention all this not because I am driven to do unsolicited endorsements for products I own, but because I think this video is pretty funny. I just learned that American Libraries offers some online features. My article, appearing in the January, 2010 issue, can be found by clicking the title of this entry. I've written before about troubles getting Linux to work in a Windows world. Today, it occurred to me to try something I dimly remembered: getting Firefox to pretend to be Internet Explorer using a plug-in called User Agent Switcher. It's an easy download. Then I restarted Firefox, pulled down the Tools menu, and went to Default User Agent>Internet Explorer>Internet Explorer 6. Voila, I immediately had access to our payroll system. Which means that, since the only thing this does is send a different string of letters to identify the browser, Firefox 3.0.16 is deliberately disabled by my vendor. Complaints to follow. Meanwhile, this was a MUCH simpler solution than the wine approach, which seems only to work SOMETIMES. I'm kind of proud of this one. I thought it up as an idea, but it was realized by our creative team. The tag line: "imagine it." And once you imagine it, it becomes possible. I've noticed that we now have a LOT of videos on youtube. Click here for the whole list. And so begins "twenty-ten" (which rolls more trippingly off the tongue than two-thousand-ten). My only real regret, looking backward, is that we did not call each of the past ten years an "aught," as in "aught-nine" for 2009. Most used "oh-nine." But perhaps that captured the mood of faint despair even better. Anyhow, as we approach geezerhood, at least now we can refer back to things that way: "You whippersnappers think you have it tough? Why, I remember back in aught-eight when the recession wiped out my 401 (k)." I may have to buy a pair of bib overalls to really pull this off. I take comfort in the fact that today I solved the "evil" sudoku in the Denver Post. Sudoku has proven to be a pretty reliable guide to my general intelligence for the day. The joy of Sudoku is when the code has been cracked, and it's the heady race to fill in the final boxes. But that, of course, is utterly dependent upon the careful and patient working through of options first, the sifting for reducible patterns. Inattention at the beginning leads to frustration at the end. Isn't that the way of things? I am not ordinarily the sort of person who does "resolutions." On the other hand, I typically do try to identify three or four goals for the year. This next year, I'm hoping to concentrate on two big efforts; a statewide public library advocacy initiative, and some long overdue home improvements. To feed the soul, I'd like to go even deeper into haiku, and do more walking. Beyond that, I need to pay more attention to my friends. And of course, this could be the year the Tuna Boys make it big.